Zanussi washing machines come with a range of unique features that make laundry a breeze. Affordability, and a wide range of sizes and programmes make this brand a trusted favourite. With capacities ranging from a nice and compact 3kg up to a high-load, family-friendly 10kg, there’s a Zanussi washing machine for every household. With energy ratings from A to A+++ to choose from, these machines are kinder to the environment, and help cut the energy costs of everyday washing. Zanussi washing machines stand out thanks to their great range of handy features designed to make washing easier. Choose from fabric cycles for wool, synthetics, cotton, duvets, delicates and more, and innovative programmes like easy iron and refresh. 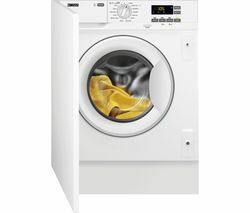 The Zanussi ZWF01483W uses its intelligent AutoSense function to automatically adjust cycle times and water volume according to the size of the load. And whatever Zanussi you choose, you’ll have a 30@30° Quick Wash option that lets you wash a 3 kg load at 30°C in only 30 minutes. Taking the hassle out of laundry tasks with a range of innovative functions, and at a pocket-friendly price, a Zanussi washing machine delivers efficient, eco-friendly, easy washing every day. Take a look at Zanussi's great range of tumble dryers and leave your clothes clean and dry.